Predicting the success of a teenager is not easy. There are several factors to keep in mind, and it’s more than just evaluating talent and individual quality. From the opportunities given to the way a young footballer adapts to the professional level, there are so many dependent variables that determine a player’s success. For the past six months, the world has had the opportunity to watch the rise of a star. Every weekend, every game, there are fewer and fewer doubts that João Félix will make it to the top of the football world, something that was always talked about in Portugal, but the real confirmation only came this year. In his first full season in Benfica’s first team, he has had total responsibility under Bruno Lage’s system. Playing as a second striker, the teenager, who played for his main rivals FC Porto during his youth career, has a crucial role on Benfica’s offensive strategy. Félix has shown impressive qualities in exploring spaces between lines, holding the ball and waiting for support from his teammates in order to create opportunities and outnumber the opposition in specific areas of the field. Adding to his superior knowledge of the game and his technical abilities, the 19-year-old is an incredible finisher, which is admittedly rare for a creative playmaker. With obvious differences in their career achievements and longevity, Félix is usually compared to the Portuguese legend Rui Costa, who also played in Benfica, but unlike Costa, Félix is more of a natural goalscorer. In front of the goal, he is strong on either foot, and with quick finishing and precise shots, he’s lethal striker. Despite being just 5’11, Félix has an impressive vertical jump and burst for a player of his height (5’11). With already 15 goals in the season (36 games, 26 starts), he scored in every competition he’s played in this season, except the Champions League, where he only played 74 minutes. 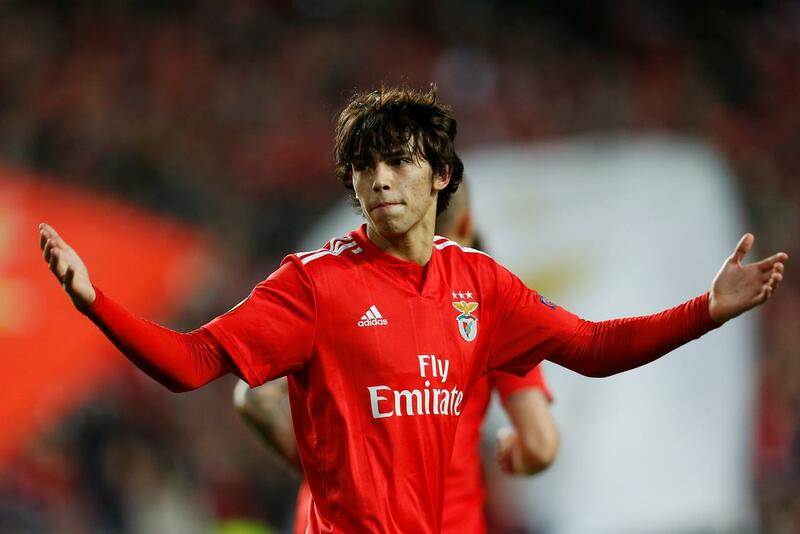 The last game against Eintracht Frankfurt saw Félix showcase the skills that he has delighted Benfica fans with, and tortured his opponents with. 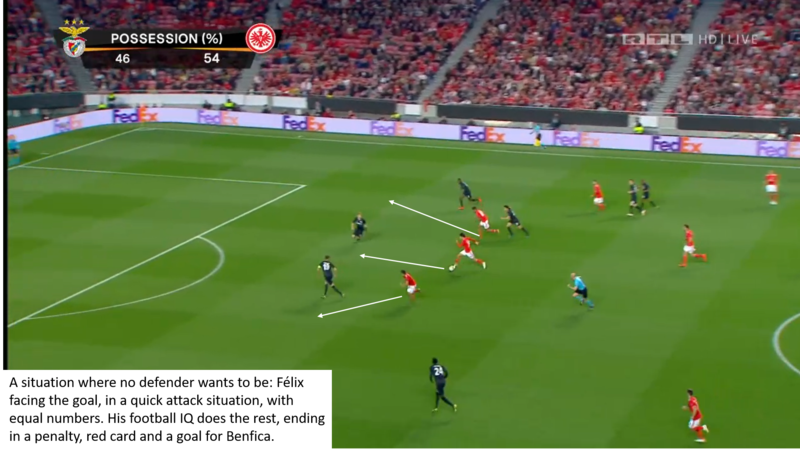 In the first leg of the Europa League quarterfinal, Félix controlled Benfica’s attack and helped churn stale possession into quality attacking opportunities. Even with the likes of Luka Jović and Rafa on the pitch, Félix was a notch above the rest; his movements to exploit space, his body positioning to get the best possible first touch in every play, tucking in as a false 9 to attract defenders and create space between Frankfurt’s back three for Rafa and Franco Cervi. Against a team known for a high-pressing system and tight spaces in defense, Félix was vital in ball circulation, which sliced through Frankfurt’s defense. Showing up between the lines, turning and facing defenders, creating superiority in numbers in the midfield and interchanging with Gedson Fernandes, he allowed the other Portuguese youngster to appear in advanced areas. This was how different goalscoring opportunities were created, such as the penalty scored by Félix in the first half. As he has been scouted by every possible big-5 European club, Félix’s exhibition against Frankfurt put him on a pedestal rivaled by few in world football. Showing up in big occasions is a key factor for world-class players, and Félix has shown that he is capable of it. Two goals against Sporting CP this season in four derbies, one against FC Porto in “O Clássico”, and now 3 goals in Europa League. His transfer to a bigger club is inevitable, even though there are still hopes for Benfica’s fans that the youngster will stay an extra year in Portugal. As opposed to the current stars of Portugal, Cristiano Ronaldo and Bernardo Silva, João Félix has everything to create an impact while still playing in Portugal. Cristiano left Sporting when he was 19, while Bernardo never played a game in the Portuguese League. Staying one more year in Portugal could be beneficial for everyone. For the player, who would have plenty of playing time and highlights as Portugal attempt to repeat their Euro triumph, he’d be guaranteed a spot in the national team’s squad. For Benfica, they’d reap the rewards of having him for another year, and they’d sell him for a higher fee. For the prospective buyers, they could avoid another “Renato Sanches case” by buying a youngster too soon and not letting him grow with minutes, even if it means paying more. Félix and Portugal’s generation of ’99 have the chance to create a golden era in the Portuguese football history. Leading the line will be the crown jewel himself, who on Thursday, left no doubts about his potential. If he keeps improving at this rate, Félix will be a Ballon D’or contender.